January’s Jays found. And somebody won a mug. The January Hidden Bird Contest was different. Instead of finding one bird, you had to find at least three Blue Jays. Or any kind of jay. We’ve been seeing a lot of jays this winter, so we figured we’d honor their abundance by making the contest about them. And there was an abundance of Jay-finders, too. They searched our site and told us where three or more jays were found. We took their names, threw ‘em into a hat, and picked one at random. Chris C., of Fort Worth, Texas. 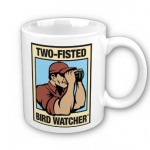 Congratulations Chris, you win a Two-Fisted Bird Watcher coffee mug. Now on to the next contest. But wait…. No Hidden Bird This Month. We’re taking a break from the contest while we make some plans for our future that might or might not involve a redesigned site. Meanwhile, feel free to explore the categories and pages that piled up here over the last few years. There are some photos and stories you might enjoy, even if there’s no mug at the end of the tunnel this month. 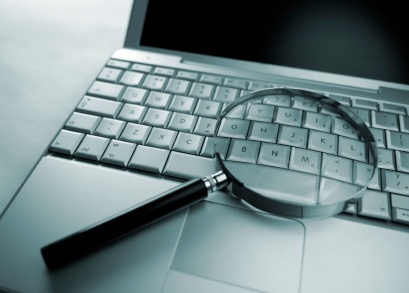 If you’ve played our Hidden Bird Contest in the past, thanks for your participation. We hope you enjoyed going birding from your keyboard. We enjoyed hearing from you. Stay tuned for what’s next. There’s more bird watching to come. This entry was posted on Friday, January 31st, 2014 at 5:17 pm	and is filed under "Hidden Bird" Contest. You can follow any responses to this entry through the RSS 2.0 feed. You can skip to the end and leave a response. Pinging is currently not allowed.